Employers have a duty of care to employees to provide a safe working environment – both physically and emotionally – free from health and safety risks. There are also laws around the world that mandate this. Managing workplace safety effectively should be a top priority for every company. Having good policies and procedures in place that spell out your organization’s commitment to and expectations of a safe work place is the best place to start. These policies should be widely communicated, and it should be made abundantly clear to staff at every level in your organization that the are not negotiable – every member of staff has an obligation to ensure that the workplace is safe. Ongoing communication and education campaigns are essential to help foster a culture of workplace safety. 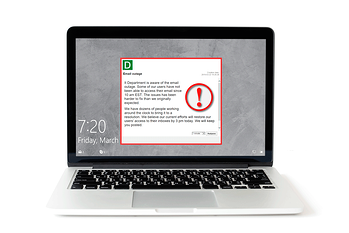 DeskAlerts can help your organization to spread the workplace safety message. DeskAlerts is an internal communications software solution that helps you to communicate quickly and effectively with your employees. It works by sending pop-up notifications direct to employees’ desktop computers, appearing on their screens no matter what other app or software they are using at the time. Messages can’t be skipped or ignored and require a user response. It’s a much more effective way of communicating than emails or intranet web content as you can be assured that your employees have seen your message. The software has a statistics module that lets you see which employees have seen the notification and which ones haven’t. Many organizations around the world are using the software to help deliver internal communications campaigns, seeing it as a simple, yet effective, way to get their important messages out to employees. When communicating about workplace safety, it’s a great way to send reminders, hints, tips and advice about what employees should be doing at work to keep themselves safe. You can communicate on issues such as identifying and reporting hazards, what your workplace health and safety policies and procedures are and tips on being safe unique to your specific work environment and any equipment that your employees use. DeskAlerts supports video, so you can use it to send educational and instructional videos to employees so they can visually understand the issues and know what to do to be safe. It can also be used to hyperlink to more in-depth content that lives somewhere else, for example on your company’s intranet site. There’s also a feature where you can send quizzes, surveys and polls to check your employees’ levels of knowledge around workplace safety, and adjust your educational material to suit. The system can be used alongside any other internal communication channels your organization uses such as emails, staff newsletters, corporate social enterprises, intranet and so on. This can help with repetition and reinforcing of your key messages.